Here is a "block" (In quotes, because you could arrange the pieces in any manner.) 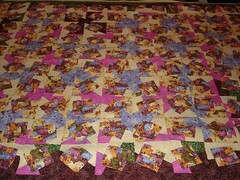 I arranged them so that the brown would create a border - then I had some extras, so I made a couple focal pinwheels. 2 things on my list on things to "finish" before Thanksgiving in America. I took my first class only 10 yrs. ago and my only regret is that I had not taken a class sooner. 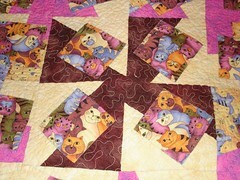 My quilting life would have been so much easier. I'm still proud to show off my earlier quilts. After all, they were made by me.